To all who organized and led the trip to Poland, I want to extend a heartfelt Yishar Koach and thank you. I shall always remember your open-hearted invitation to join you and your warm welcome for the 48 hours that I spent with you. More than that, you were even prepared to divert the group to visit Kalisz, the first Jewish community in Poland where Jews came in 1138, and the hometown of my own Arkusz family. It was an emotional experience to accompany my son, Leo, to the Jewish cemetery and Memory House there, and to reflect on the fact that we were the first members of the family to be in Kalisz since numerous uncles, aunts and cousins were taken from there in the Shoah, never to return. It was a privilege for the group to be led by Rosh Hayeshiva Rav Baruch Gigi and Rav Yair Kahn. Their divrei Torah and insights were highly pertinent and meaningful. They are rightly held in deep respect by the talmidim with whom they interact with modesty and warmth. The group was fortunate to have Rav Shalom Berger to lead its educational program and convey the many significant historical episodes and messages with great skill, a lightness of touch and a knack of making history meaningful and relevant. I am indebted to Rav Berger for undertaking his own additional research into the kehilla of Kalisz. His efforts have introduced me to new sources of information and have even resulted in locating a branch of the family in Israel of whose existence we were unaware. Thank you also to Craig Lubner, who was so helpful in making my arrangements in advance and to the madrichim, Mark Herman and Aharon Herskovitz. The talmidim themselves were as ever an inspiration. They undertook the trip with a sense of great responsibility and sensitivity. 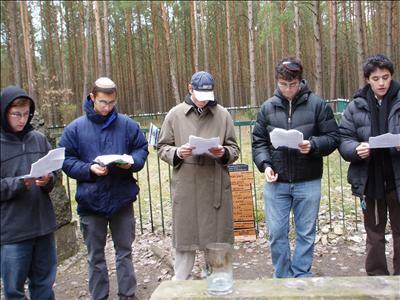 I shall always remember with pleasure the outstanding Shabbat we spent together in Lodz. The ruach in the intimate Reicher shul, the only one in Lodz that was not destroyed, was quite incredible. Together with the divrei Torah from the Ramim, their kavana, singing and dancing, brought that shul alive again. As a parent, I can only feel gratitude that the Yeshiva is building on the firm foundations that are the eternal legacy of those pre-war generations in Poland. It is a huge source of pride to see your Ramim and talmidim teaching and learning together. It was a privilege to be with you on such a meaningful journey and it will be memorable for me always. Thank you.